Darien Dash, which had been scheduled for this Saturday, March 9, has been cancelled by the Darien Youth Commission due to an unexpected circumstance for an organizer (unrelated to the event). Refunds will be made for any registration payments. Registration is open for the Darien Dash, a town-wide scavenger hunt that takes place Saturday, March 9 from 1 to 3 p.m. Teams registered for the event will compete by answering town-based riddles and by visiting participating stores based on clues. The third annual Darien Dash, organized by the Darien Youth Commission, begins at the Town Hall gym and ends at The Depot Youth Center on Heights Road, where points will be tallied and prizes given to winners. First, second and third place prizes will go to the teams with the most points. In the event of a tie, prizes will be given based on earliest arrival at The Depot. “We are happy to host this event, which has received such a positive response, for the third year, and are thrilled to offer this exciting activity to families and the youth of the town,” said Darien Youth Director Alicia Sillars. “Since it is open to all ages, it’s a great way to include everyone in on the fun,” Sillars said. Participation in the Darien Dash is open to all ages, but requires a vehicle and driver to travel about town, based on answers to riddles. Participants will be limited to the first 25 vehicles to register. Team members may not exceed the number of seat belts in vehicles and signed waivers are required for all participants (parent/guardian must sign waiver for participants under the age of 18). The Darien Dash is one of many events hosted by the Darien Youth Commission, which develops enrichment programs and activities for youth. It is comprised of both adults and high school students. Registration forms for the Darien Dash are available at DarienCT.Gov/YC until March 7, or until the maximum number of 25 registrations are taken. Registration fee is $25 per vehicle. For more information, visit darienct.gov/yc or call 203-656-7388. The Darien Nature Center is selling raffle tickets in advance of its annual “Down on the Farm” celebration. Participants have the opportunity to choose which of the following four prizes they would like to win: a night out in Darien, a custom lemonade stand, a marble sculpture, and a Nature Center birthday party! To the editor: So who knows Darien Best??? 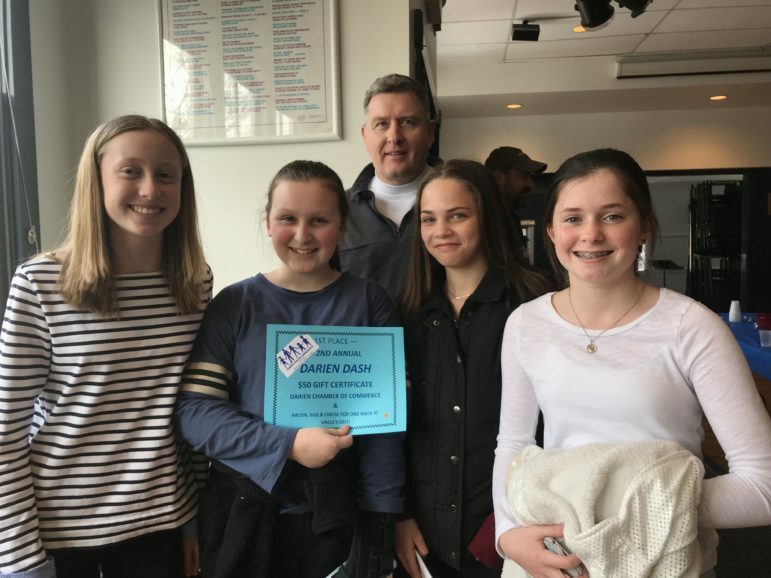 As winners of the Darien Youth Commission’s second Annual Darien Dash, apparently Jim O’Brien, Kiera O’Brien, Whitney Scallon, Sophia Condon & Lindsey Turner do!